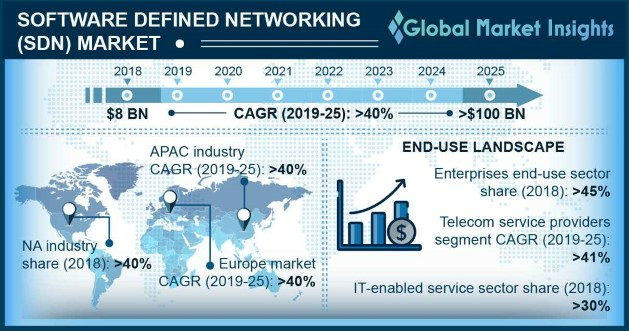 Software Defined Networking (SDN) Market size is set to exceed USD 100 billion by 2025; according to a new research report by Global Market Insights, Inc. The organizations across the globe are under increasing pressure to minimize the capital expenditure and operational costs and become more agile and efficient. This rising pressure has resulted in the widespread adoption of server virtualization and SDN technologies. The has brought a fundamental shift in the way companies are deploying their computing infrastructure. The SDN technology supports dynamic network movement, replication & allocation of virtual resources to better utilize company resources and reduce the capital & operating expenses of organizations. The SDN market has witnessed exponential growth due to the widespread adoption of new networking technologies. The use of different types of networking architectures has increased the complexity of managing & controlling networks. The network operators are looking for new ways to integrate different types of networks while meeting the challenges of increasing data traffic. The traditional networking solutions are rigid and are unable to accommodate various networking topologies within the network infrastructures. This is encouraging companies to adopt SDN solutions as it enables heterogeneous network scenarios by simultaneously accommodating multiple solutions without affecting the performance of networks. The manufacturing industry is expected to register a growth rate of over 40% during the projected timespan. The increasing proliferation of advanced technologies, such as the Internet of Things (IoT) and Machine-to-Machine (M2M), is driving the use of SDN solutions in the sector. The technology reduces the hardware expenditure by eliminating the requirements for manual configuration. It also enables a central point of control that allows operators to control the whole network as a single unit, enhancing network visibility and streamlining network management. The Asia Pacific SDN market is anticipated to grow at a CAGR of over 40% during the projected timespan. This is attributed to the increasing adoption of cloud computing and network virtualization technologies. The high investments by telecom service providers will enhance the connectivity infrastructure in the region, augmenting the use of SDN solutions. For instance, China’s telecom companies, such as China Mobile China Unicom, and China Telecom, are set to invest over USD 180 billion by 2023 in the development of the 5G infrastructure, which is expected to supplement market growth. Furthermore, increasing penetration of smartphones and the internet is also adding to market growth. The key vendors operating in the market are HP, AT&T, IBM, Intel, Juniper, Huawei, Pics8, Big Switch Network Plexxi. Extreme Networks Arista Network, Pluribus, Pics8, NEC Corporation, and Cisco. The major players are strategically acquiring various SDN-based start-ups to enhance product capabilities and gain technical expertise. For instance, in November 2017, the VMware acquired Velocloud to expand its presence in the software defined networking market. VMware intends to integrate Velocloud’s SDN technology into its existing product portfolio.